Wibby Brewing crafts American-influenced, German-style lagers in Longmont, Colorado. At Wibby Brewing, we start with traditional German lager brewing principles and add the American craft twist. Our craft lagers are brewed with German malt, American hops, and Rocky Mountain water. Cold fermentation and enhanced conditioning allow for our lagers to be bright and full-flavored with a crisp finish. The tasteful result is a collection of unique American lagers that few breweries in the craft beer community have explored. Cans of our Lightshine Helles, Wibby IPL, Moondoor Dunkel and Lightshine Radler, as well as our seasonal Double Dunkel, are available in our taproom! Wibtoberfest can be found for a limited time in a few stores! Can't decide? Grab a Lager Love Mixed 12-Pack! Click here to see where you can find our cans. A hoppy red lager with a smooth malt finish and a pungent citrusy hop aroma. Wibby’s smoother version of your favorite IPA. Beer Advocate rated Wibby IPL 93. Supple and crisp, this delectable dark lager has a medium body, which starts with a chocolate roast and ends with ordering it again. Craft Beer & Brewing Magazine rated Moondoor Dunkel 93. Lightshine Helles with a splash of raspberry lemonade that we make in-house. Refreshing and delicious, this radler is as sweet as a summer day. This light, sweet-finishing, Bavarian-influenced lager will keep you on Wibby Brewing’s patio 30 minutes after you meant to be home from work. Beer Advocate rated Lightshine Helles 92. We brew lots of different, special, and limited lagers throughout the year. This list features what is currently available on draft at our taproom. To find a Wibby lager near you at one of our restaurant or bar partners, please use our beer locator. One of our most popular seasonals, the Double Dunkel is an imperial dunkel brewed with lots of chocolate malt and cacao nibs. We lager it on Madagascar vanilla beans. This is a highly drinkable, slightly dangerous lager that is smooth and has a nice, crisp finish. Craft Beer & Brewing Magazine rated Double Dunkel 93. Volksbier Vienna is "the people's lager"! We used all German ingredients for this mild, amber, malty beer. This beer took home the silver medal in the Red or Amber Lager Category at the 2018 Frankfurt International Trophy. Our Irish Red returns! A red lager brewed with biscuit malt & English hops. A slight malty sweetness with a hint of caramel. Sláinte! The oats used during the brewing process create an enjoyable, creamy mouthfeel. Schwibby Schwarzbier is well-balanced and super drinkable. Enjoy this dark lager throughout the long nights of winter. We added Hotbox Roasters cold-brew coffee to our Double Dunkel. Dusk to Dawn is a black India Pale Lager. This beer has a distinct earthy and citrusy hop aroma, as well as a smooth, toasted, nutty flavor from the addition of toasted buckwheat. Brewed with amateur brewer Tiago Verdini from Brazil, this is a typical bock with a dark amber hue that is super malty and smooth. This lager was entered into the Pro-Am Competition at the 2018 Great American Beer Festival in Denver. 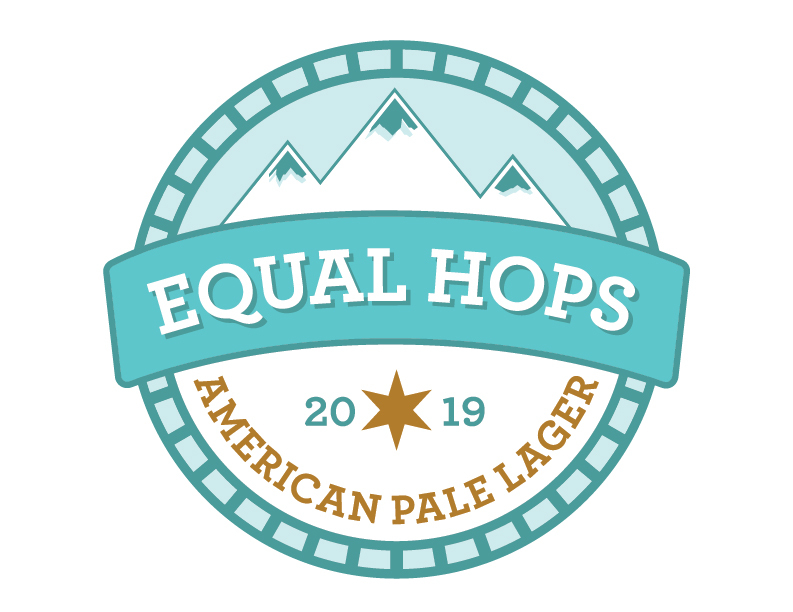 Equal Hops has equal parts Cascade and Crystal hops. Smooth and well-balanced, this American pale lager has notes of caramel.